Jeff and Jodie joined ATM2GO at the beginning of 2015, taking over the area where ATM2GO started - the northside of Brisbane. Jeff and Jodie are no strangers to the franchise system as they have previously managed another franchise business also in the northern suburbs of Brisbane. With over 10 years experience in business management Jeff and Jodie have hit the ground running and quickly bought on board a number of new event ATM clients including the New Year's Day Foam Party, Beer Festival and Rodeo at Eatons Hill Hotel. Eat Street markets is also another big event that Jeff and Jodie manage. 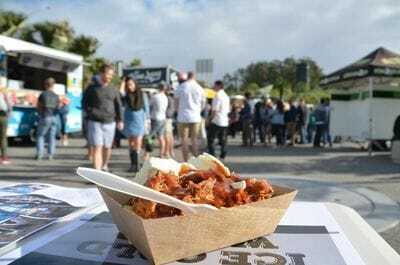 This market continues to grow and develop and always has a crowd of people from all over Brisbane turning up to decide what they can tempt their taste buds this week! Click here to keep up to date with news on opening hours, weekly specials and entertainment. 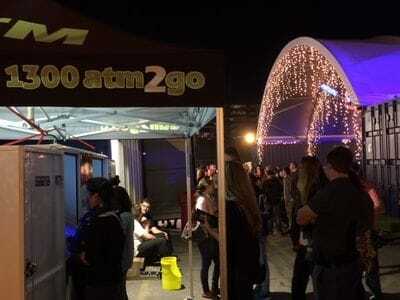 Jeff and Jodie also manage a number of markets in their area, including Eagle Farm markets where ATM2GO have been providing the convenience of cash to patrons for close to four years. Click here to keep up to date with regular special events at Eagle Farm Markets. As well as being passionate about their business and ensuring that cash keeps flowing for our clients, Jeff and Jodie are enjoying attending all the events and taking in all the new experiences that our clients bring. Thank you to Jodie and Jeff at ATM2GO for your excellent customer service at the Bardon State School Mayfair 2018. 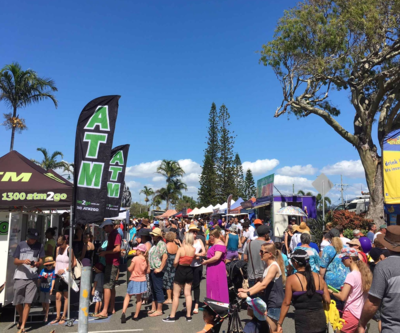 We have had a bad experience in the past with a different company who provided an ATM that malfunctioned on the all-important, fair day. You provided reassurance that this would not occur, and even if it did, you would be on hand to rectify the situation ASAP. As it turned out, your ATM's worked perfectly all day, without a hitch, and we have raised a record profit for our school this year. A working ATM is an essential facility at every school fete seeking to maximize the fundraising opportunity that the day provides. We can highly recommend this company to other schools and community organizations requiring a portable ATM service. We will be in touch next year! You guys are an absolute pleasure to work with. Amazing customer service, easy to communicate with and you make bump in and out a breeze when onsite at events. Our long association proves our satisfaction with ATM2go. Many thanks Jodie and the team. Catch ya in May 2020! We highly recommend Jeff and Jodi and ATM2GO - brilliant service! Thank you for playing a part in making the fete such a success!